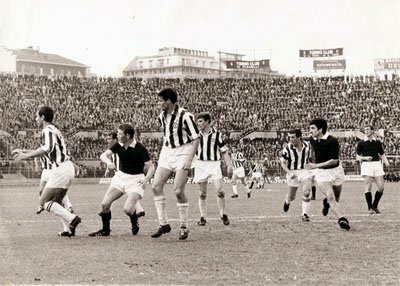 Juve against home town rival Torino in the season 1965-1966. In the 19th century Turin was a small town until the start of factories in the 1870s. As a result of the wealth of local merchants the first Turin football club, Juventus, was established at the end of the century. At its establishment, on 1 November 1897, it was called Sport-Club Juventus. The black and white strips, that today is primarily associated more with Juventus than any other football club, actually has its background in England and one of the first football clubs, Notts County. At the beginning of the 20th century, when the team needed to replace the washed out pink shirts, one of their English players was asked to arrange something from his home country. The shirts that arrive were Notts County replicas. In the 1950s and 1960s the foremost company was Fiat and people from the poor southern Italy were moving in masses to Turin for the work opportunities. Turin became an industrial town and that circumstance has historically matched well with football success for the local teams. The list of football legends who have played for Juventus is quite extensive. In recent years players such as forwards Alvaro Morata and Paul Pogba are some of the world-class football players. In earlier years, the club has also been home to football legends such as Michel Platini, Zinedine Zidane and Alessandro Del Piero. Juventus has managed to spend most of its history in the Serie A, with the notable exception being the 2006/07 season. The club has also been wildly successful throughout its history, which is why it is considered a symbol of the country's “Italianness”, locally known as Italianita. Juventus has managed to win 59 official competitions, which is more than any other Italian football team has done. Of these, 48 wins are from domestic competitions, while 11 are from official international competitions. In particular, the club has won the Scudetto (league championship) 33 times, the UEFA Champions League 2 times, the Coppa Italia 10 times, the Intercontinental Cup 2 times, the UEFA Europa League 3 times, the UEFA Super Cup 2 times among other titles in major sporting events. In 2001, the club set a world record by selling Zinedine Zidane to Real Madrid for about 75 million euros, the most expensive transfer ever at the time. In the same year, the club also set the record for the most expensive transfer for a goalkeeper at the time when it paid 45 million euros for Gianluigi Buffon. Juventus have for the most time been rather consitent regarding the logo. In 2004 the logo was redesign, but only with slight changes (right image). The black and white strips of the team shirt could be seen on the crest as well. Just above the middle in the crest the name of the club is written and below that a crown and a shield with a drawing of a stallion. Juventus was also the first club in football to adopt a gold colored start above the crest. The star was used as a sign for ten league titles. Being the winner of over 30 Scudettos, Juventus could claim three stars as an extension of the logo. In 2017, Juventus adopted a new logo in modernistic style (left image), which was very apart from the tradtional crest. 1897 The club is established (as Sport-Club Juventus). 1900 First competition match (Third Federal Championship, against Torinese). 1905 Winning Serie A for the first time. 1977 First UEFA Cup title. 1983 First Cup Winners' Cup title. 1985 First European Cup title. 1985 First Intercontinental Cup title. 1995 First Supercoppa Italiana title. 2003 First Champions League title. 2006 The club is relegated to Serie B for the first time in its history. 2016 Gonzalo Higuaín is transferred for €90 millions, a new club record. 2015-16 Round of 16 Eliminated by Bayern M.
2012-13 Quarter-finals Eliminated by Bayern M.